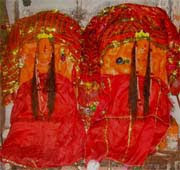 Goddess Hinglaj Mata is a manifestation of Goddess Shakti and she takes her name from the mountain cave Hinglaj on the Makran coast in the Lyari District of Balochistan in Pakistan. Hinglaj Mata Puja date in 2019 is April 3. Many people from India travel to Hinglaj Temple to offer pujas during her Jayanti period. Legend has it that Vishnu cut the body of Goddess Sati – to stop Shiva’s lament after Sati’s death – part of her head fell at Hinglaj or Hingula. Thus this is one among the 51 Shakti Peethas. Hinglaj Mata gave darshan to her devotees on the 13th day of the Krishna Paksha of Chaitra Month as per traditional calendar followed in North India.